HATTIESBURG, Miss. – Southern Miss Lady Eagle Basketball Coach Joye Lee-McNelis was named Conference USA’s Coach of the Year for the 2016-17 season and senior Brittanny Dinkins was named Defensive Player of the Year. After being picked to finish eighth in the league’s preseason poll, McNelis lead the Lady Eagles to a 21-9 overall record and a 13-5 mark in conference play. 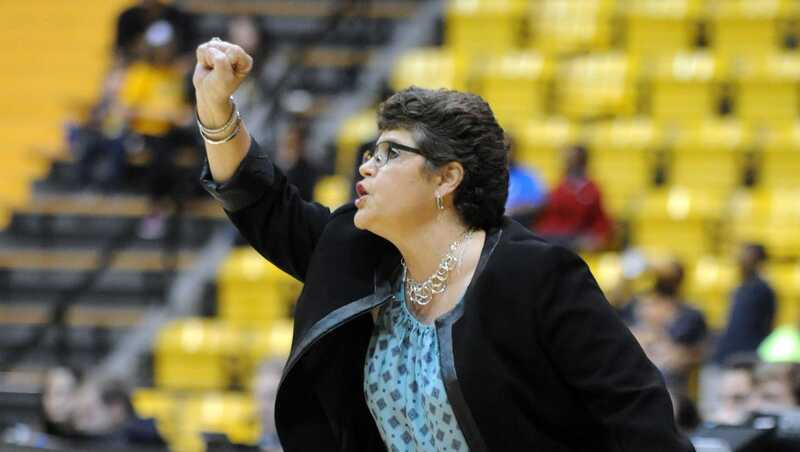 McNelis, in her thirteenth season at the helm of Southern Miss, has notched 20 or more wins in three of the past four seasons and five total times at Southern Miss. During the season, McNelis eclipsed 200 total wins at Southern Miss, bringing her win total at Southern Miss to 213 and 442 wins overall as a head coach. This is the second time McNelis has been named C-USA Coach of the year. She had previously won the award in 2014. This is third C-USA Coach of the Year award for a Southern Miss Women’s Basketball coach and the sixth conference coach of the year award. Dinkins, a four year player from Miami, Fla., led the conference in total steals (100) and steals per game (3.2). On the season, her total steals were good enough to be ranked seventh most nationally and in program history. The senior’s steal’s average was ninth highest in the country and her career total steals (275) is the seventh most by any Lady Eagle. The Floridian’s defensive pressure helped Southern Miss set a single-game record for turnovers forced (46, vs. William Carey) and tie the individual season-game steals record (10, vs. Old Dominion). The Lady Eagles forced the seventh most turnovers per game (21.73) and had C-USA’s second best scoring defense (62.2 ppg). Dinkins joins Jamierra Faulkner (2013-14) as the only Lady Eagle to receive the C-USA Defensive Player of the Year verdict.